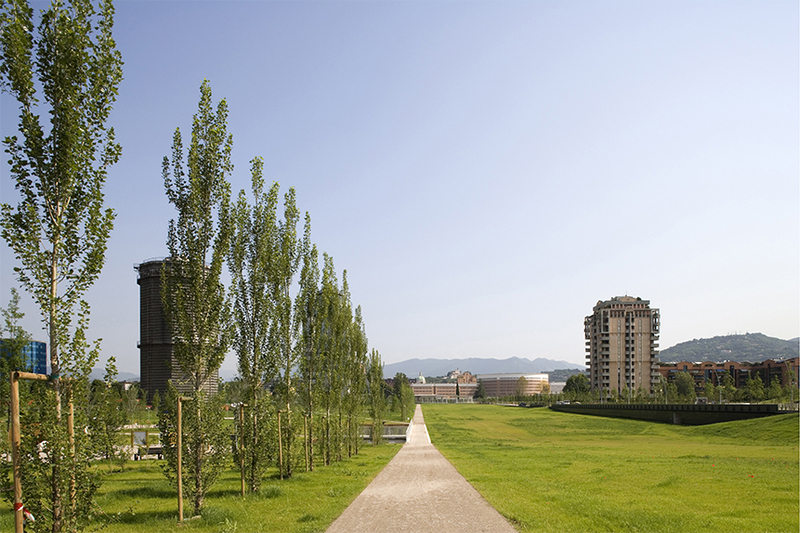 The new urban park ‘Tarello is one of the most important green areas of the city of Brescia. 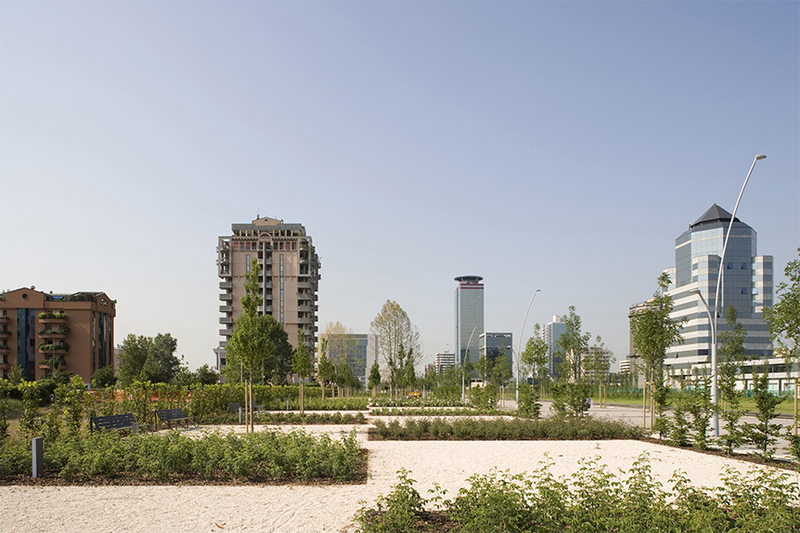 Located on an industrial and agricultural area, in the Brescia’s former southern periphery, the park creates an attractive centre for the growing district ‘Brescia II’. 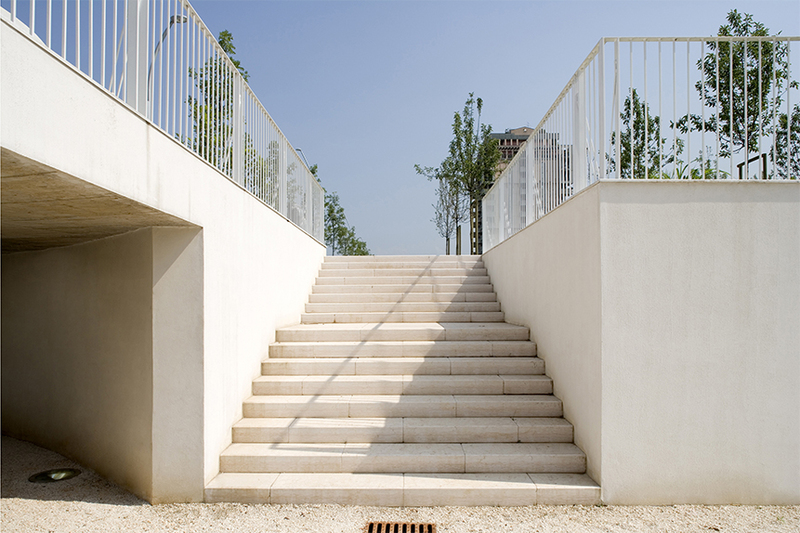 This project understands landscape as an ecological and urban design and planning issue solving infrastructure. 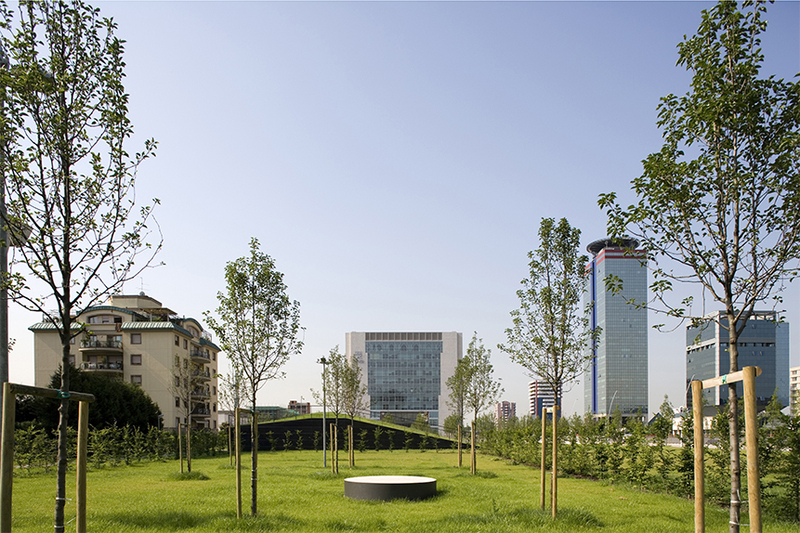 An expanding city based solely in functional structures – roads, buildings and infrastructures, not integrated in a global idea of landscape conception, generates disparate residual spaces, usually shattering existing relationships between Man and Nature. 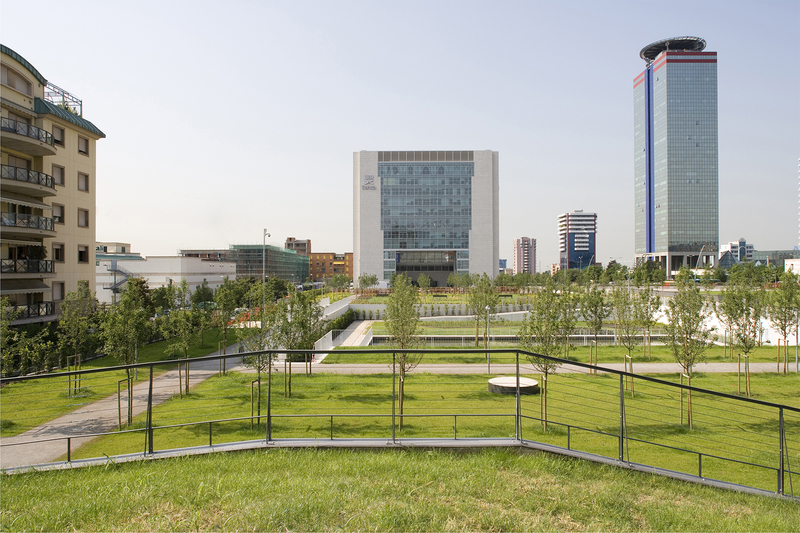 The ability of defining a morphological limit, constituting an urban space, adding an ecological and environmental value to this city, as well as changing the space around this park and relating itself with it, demands a clarity that did not yet exist. 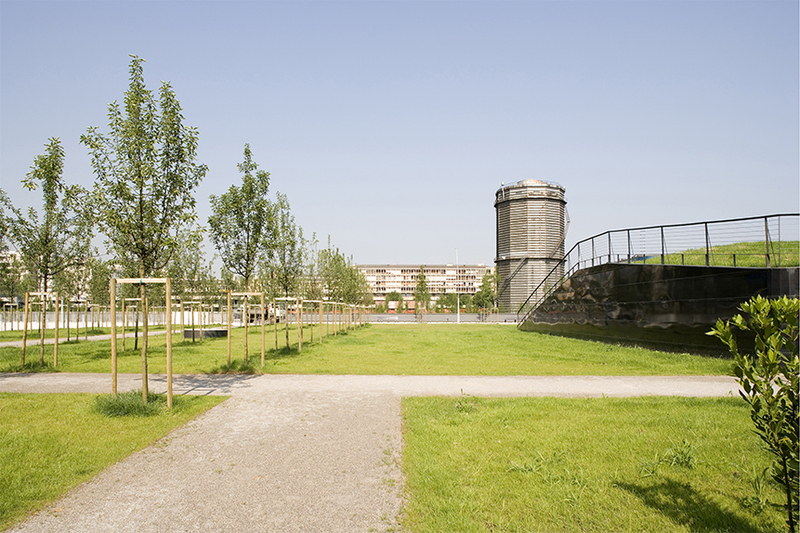 New relationships with the surrounding urban space need to be designed, and also, connecting the pre-existing transportation infrastructures with new paths and ways is of great importance. 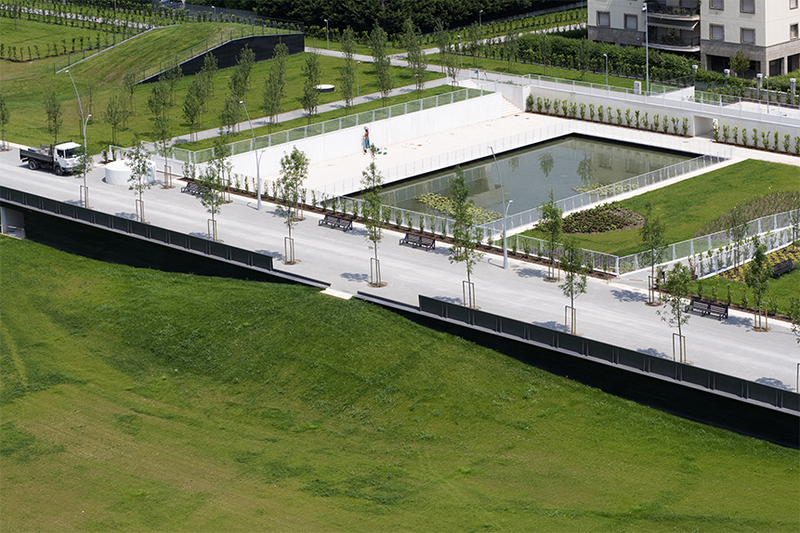 The tipology of the park consists of an open linear space, visually centred with the Cidneo Hill. The North-South altimetrical variation is smooth and continuous, whereas the West-East variation has a more scattered character. 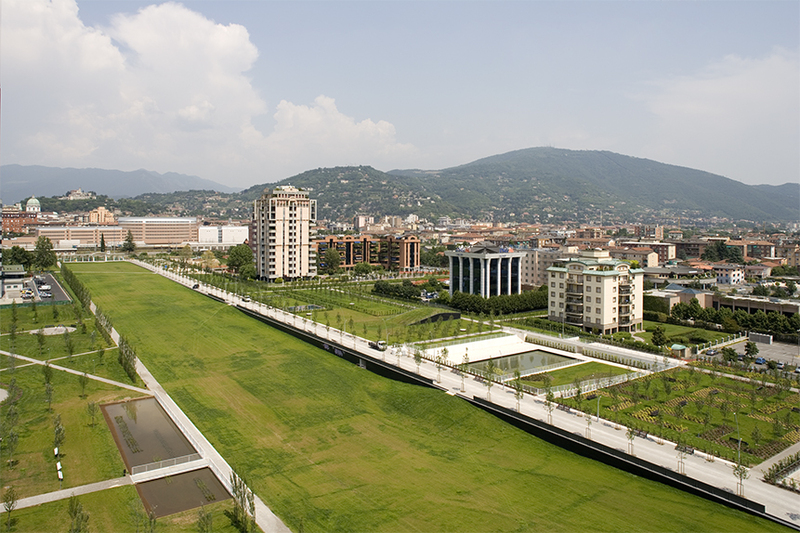 This difference generates a grand visual opening, where the Cidneo Hill is permanently visible, both in the central space as well as in the main paths, enduring the continuity between the park and the city. 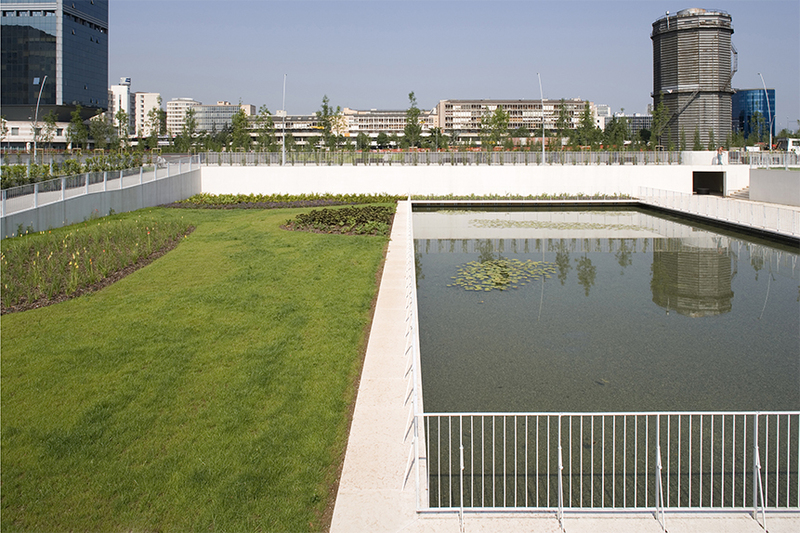 Furthermore, the North-South opening allows a better atmospheric drainage, and in this way improving the urban quality. 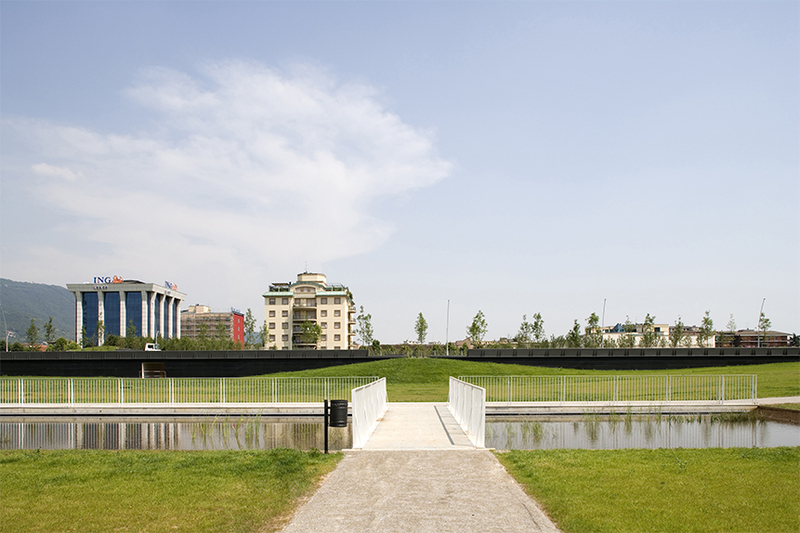 The park site consists of a slight slope, descending from the city, crossed by an abandoned riverbed, determining the use of water as a main theme. 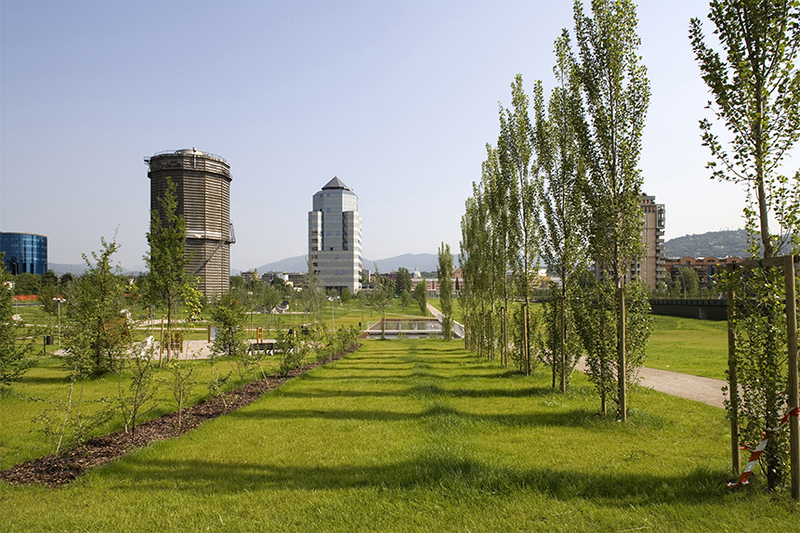 Its use assumes a structural role in the park design, ruling the vegetation distribution. 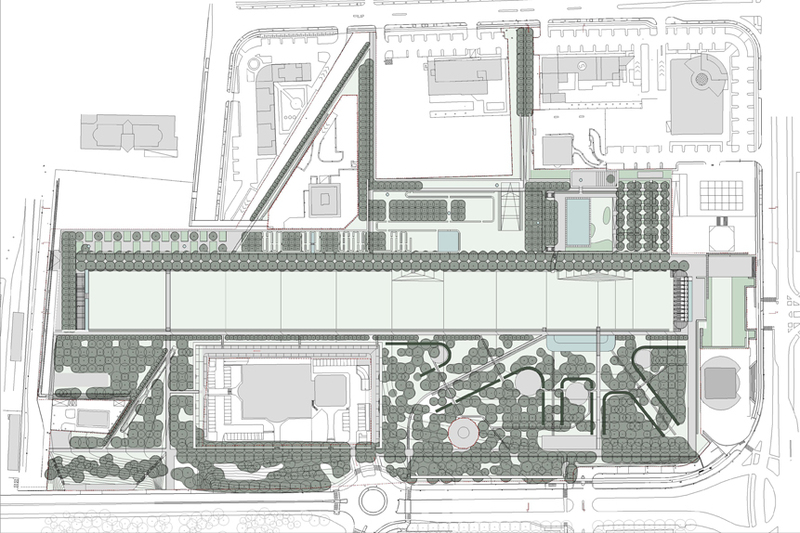 The first prize winning design foresees a re-adoption of the adjacent urban grid into the park design. Also, by emphasizing the visual contacts and the physical connections, the mediation between the historic city and the suburban south city is assured. 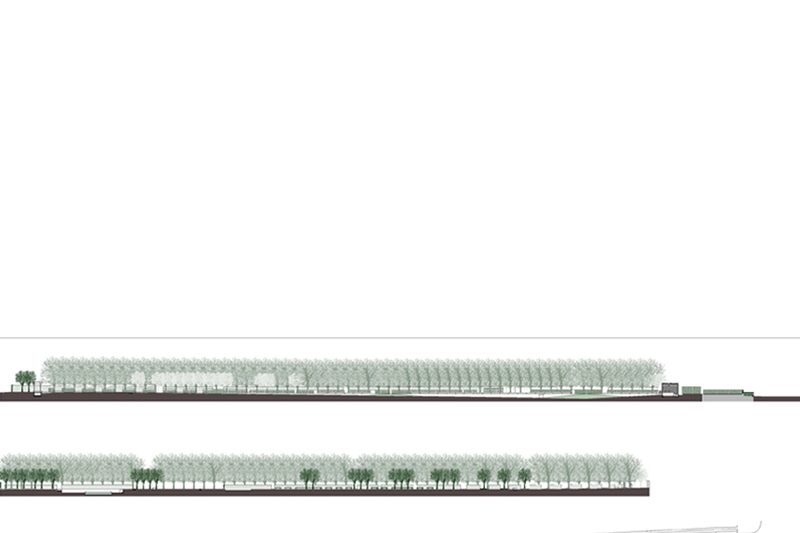 The large central open space, a grass corridor is framed by a row of elms on the western side and by the irregular, heavily planted eastern wood area. Sports and leisure facilities are integrated in the latter, whereas a group of gardenrooms are aligned with the western limit. 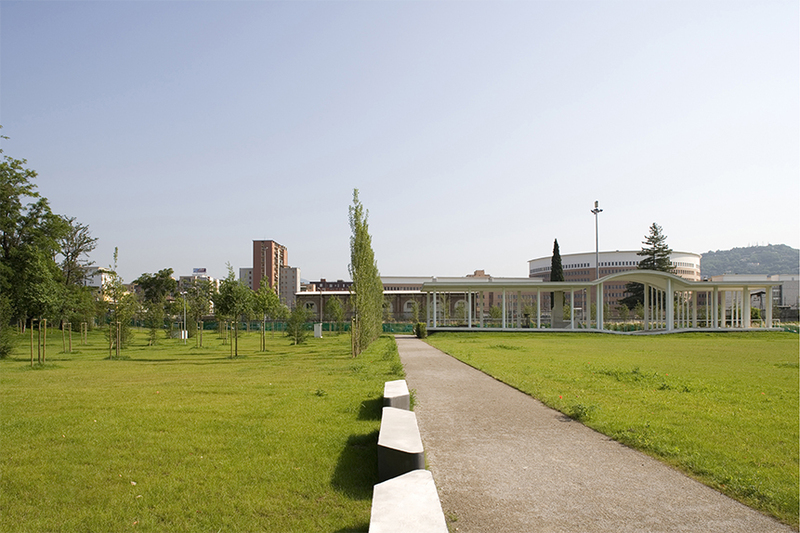 The contrast between the large scale spaces such as the central open space and the wood areas, and the smaller scaled park elements located on the park limit, not only creates an interesting physical tension/relationship in the park, but also builds a connection with the surrounding city, reflecting the characteristic irregularity of scale of suburban urban compositions. 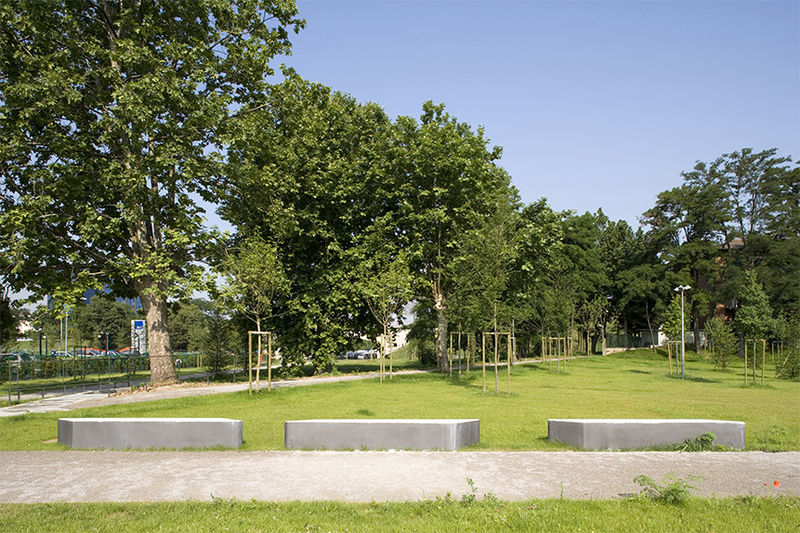 The approach in diverse scales, controlling dimensions and proportions is a part of the conceptual process, and is of capital importance in the integration of the park in the existing landscape.The planted trees and plant species refer to the biotop of the Paduan Forests with the exception of a limited amount of exotic species introduced in the gardenrooms. 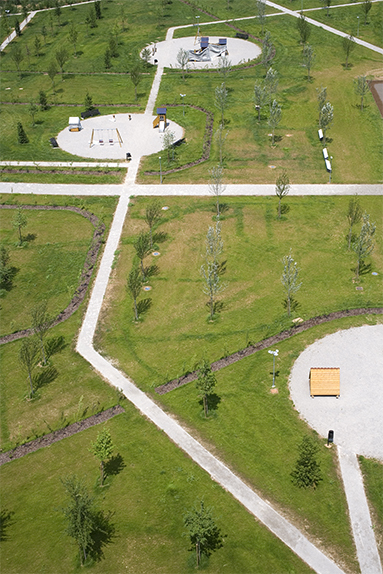 The overall park design agrees with sustainable design guidelines. collaborators: Catarina Raposo, Victor Beiramar Diniz, Sebastião Carmo-Pereira, Pedro Oliveira.